Our prepress department includes typesetting, desktop design, page makeup, scanning, CD, DVD, USB production, online products and plate making. The editorial department complements our prepress services by maintaining ongoing communication with our customers especially in the early stages. 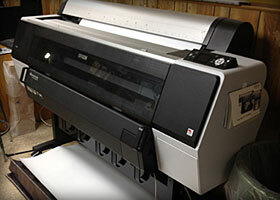 This reduces the potential for error and ensures that the final product reflects your vision. Our customers enjoy the flexibility of sending publications in the form of hardcopy manuscript, disk, electronic transmission or any combination above. We handle numerous applications from either a Windows or Mac platform including QuarkXpress and Adobe InDesign. To FTP a project, call the Prepress Department for instructions at 908-213-8981. 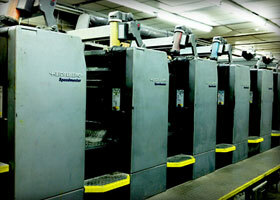 Our pressroom has a variety of printing equipment including two, four, five and six color perfecting presses. The presses can accommodate sheet sizes ranging from 8.5 x 11 up to 29 x 41. The diversity of our printing presses provides the ability to match a variety of job specifications with cost effectiveness. Forming the backbone of our pressroom are large format four and six color presses which accommodate our customers "crunch time", when deadlines are critical and schedules are tight. 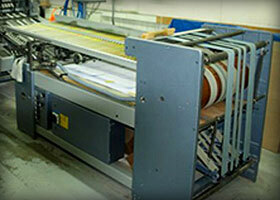 The bindery provides a variety of services in response to the requirements of our customers. 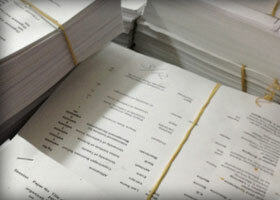 The operations include single-knife trimming, folding, cold glue binding, film lamination, hole punch drilling, paper banding, shrink wrapping, saddle stitching, knife folding, tabbing, collating, notch (perfect) binding and three-knife trimming. Our Mailing/Shipping department will tab, insert in envelopes, jiffy bags, paper/plastic band, shrink-wrap and/or box your publication for delivery. We inkjet addresses on the mail pieces and accept mailing lists in numerous digital formats on disk, email or copied to an FTP site. At their request, permit accounts are maintained for many of our customers. All mailings adhere to the strictest postal regulations and are fully automated to provide you the lowest postage costs available. We have accounts with FedEx, UPS, DHL and others for packages not going out through the regular USPS mail stream. Additionally, we maintain a fleet of vans to provide free pickup and delivery service not only locally, but to New York City and the surrounding area as well. No matter how efficient the production process, until the final product is in the hands of the consumer, the job is not complete. As the production process nears fruition, our Mailroom/Shipping department is called upon to "wrap things up" as the last stage of this coordinated effort. Sheridan Communications maintains warehouse facilities providing approximately 30,000 square feet of floor space with ample loading dock access. Some of our customers find it advantageous to utilize our facilities to store back issues versus paying the premium rates incurred in the city. 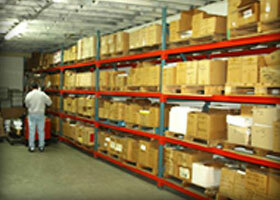 Other accounts require complete fulfillment services. Whatever your requirements are, we can accommodate them.